I'm not a fan of dumbing down food for kids. My girls (9yo allergic to dairy/egg/nuts/kiwifruit, 4yo allergic to...ahem...authority!) are great foodies, with big appetites, and will happily scoff everything listed on this blog. They never get a chance to be bored or fussy. That's not to say I'm whipping up complicated, internationally-flavoured dishes every night of the week. I'm a working mum and sometimes I chastise myself at having made pasta three times in a week (I at least aim to not serve it up two nights in a row). I mention all of this because when re-creating this dish, as with most Indian curries, there were at least 5 different spices, and that's not counting the chilli. Many parents have marvelled at my girls' ability to 'handle' curry. Though it can be hard to believe, spice does not equal heat. Yes, it can be foreign on the tongue, and a little peculiar when it hits the back of the throat, but it's by no means HOT. So while you might need to allow for maturity to appreciate chilli in a dish, by no means should you be foregoing the other spices. Your kids not used to it? Well, they weren't used to peeing in the toilet either, but they eventually got there because you persisted. Eating behaviours are no different to any other learned behaviour when it comes to kids. As with pretty much all elements of parenting, persistence is key and variety is most definitely the spice of life. So do your kids a favour and set them up with a curious and appreciative palate by varying their dishes regularly. This is even more important when they're limited by foods because of serious allergies. And finally, a curry or stew is quite simply one of the easiest things for kids to eat, especially little ones. Manageable mouthfuls, not much chewing required, they can feed themselves, and you can make it all taste damn delicious. Fry onion, garlic and ginger with spices until onion is soft. Add potatoes and toss for 5 minutes, then add tomatoes and water, and simmer for 10-15 minutes. Add chickpeas and coriander, warm through and serve. This is not an overly sweet cake, but I like it that way. The original recipe, adapted from my chocolate cake, would normally have 400g sugar (that's doubling the recipe which I've done here to accommodate the bundt pan), but I've reduced this to 250g. I figure when you're adding a glaze, it's nice to allow the icing sugar and fruit syrup to give you that sweet hit rather than the cake itself. (By all means, if you like a sweet cake, go the full 400g). I'm also enjoying subbing in alternate flours to make my cakes slightly more nutritious than the blood sugar-spiking 100% white flour. Last week I added a bit of buckwheat flour to my raspberry & coconut muffins which worked very nicely. This week it's coconut flour - a bit more fibre than your regular flour and low in carbs (not sure about the fat, but then it's a cake after all!) Just make sure when you're experimenting with different flours, you start with substituting a third only at your first attempt, so as not to make too dramatic a change to the recipe. I have done this many times and the look of disappointment on my family's faces when I've baked something inedible...trust me, it's not worth the risk. 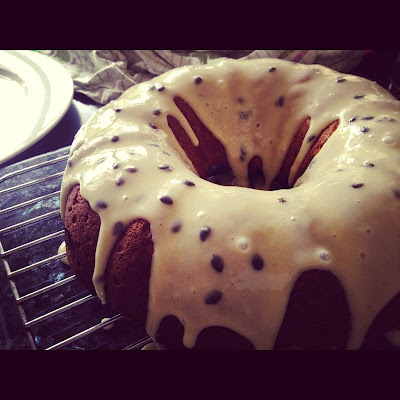 Preheat oven to 180 C. Grease a ring or bundt pan with dairy-free margarine. Sift together the two flours then add sugar, soda bicarbonate and salt, mixing well. In a separate bowl, mix together orange juice, oil and vinegar and then add to the dry ingredients, folding in gently and mixing until smooth. Pour batter into tin, smooth the top and bake in preheated oven for approximately 30 minutes or until risen and firm to the touch and a skewer comes out clean. Cool in tin for 10 minutes then turn out onto wire rack and let cool completely. 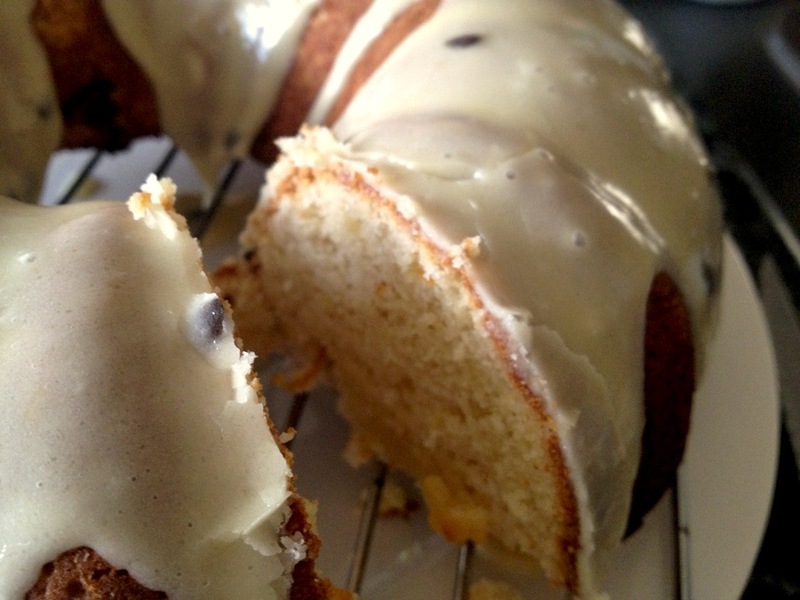 To make glaze, combine syrup with icing sugar, mix well until there are no lumps, then pour over cake. Set in fridge for 20 minutes so glaze can firm. Last Christmas, I made a festive trifle with an Italian twist - cranberry jelly layered with marsala-soaked pandoro slices and a lightly-whipped mascarpone. Not much of that was suitable for my allergic girl of course, so I made a kid-friendly version also, featuring the new love of my life: Coyo Natural Coconut Milk Yoghurt. Coyo is made from organic coconut milk, is lusciously creamy and smooth, and has a mildly sour tang - just as a natural yoghurt should. 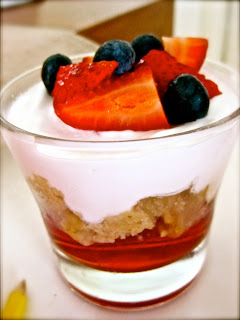 Natural yoghurt is so much more useful in cooking and baking than the sweetened stuff. Often the only non-dairy varieties available are soy-based and let's face it, soy yoghurt has that indomitable soy taste. To make the jelly, place water in a small bowl and sprinkle over gelatine. Set aside for a couple of minutes or until firm. Bring the cranberry juice to the boil in a saucepan then reduce the heat to low. Add the gelatine mixture and stir until it has dissolved completely. Remove from heat and allow to cool for 15 minutes. Pour into individual glasses for the first trifle layer (pour to just a third of glass). Refrigerate until set (at least a few hours). To assemble the remainder of the trifles, soak pieces of sponge in orange juice (or alcohol such as marsala or cointreau if you can tolerate) and layer on top of jelly. Spoon over coconut yoghurt. Refrigerate for a couple of hours, or overnight to set, then top with berries just before serving. Wattleseed is a native Australian seed from the Acacia tree. 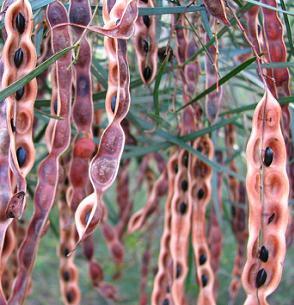 (I remember collecting the pods as a child and once took a deep sniff from a bunch of wattle flowers and have been afflicted by hay fever ever since.) Wattleseeds were a main part of the diet of indigenous Australians for thousands of years being a rich source of protein and carbohydrate. Because the acacia tree has hard husks, when they fall to the ground, they last for up to 20 years (!) in their natural environment, apparently only germinating after bush fires. 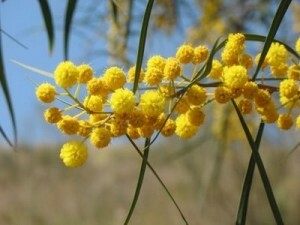 The wattle flower is also, of course, Australia's floral emblem. When I asked my seven year old daughter to guess the aroma of the ground seeds, she replied 'chocolate? coffee?'. Top of the class darling! Roasted ground wattle seed is known for its nutty, chocolatey and coffee-like flavour. 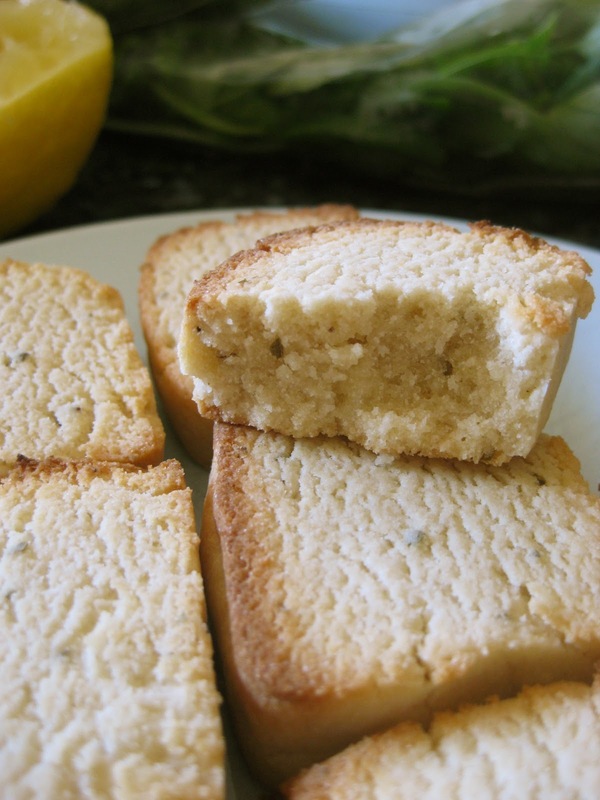 It pairs very well with cakes, cookies, bread and desserts. 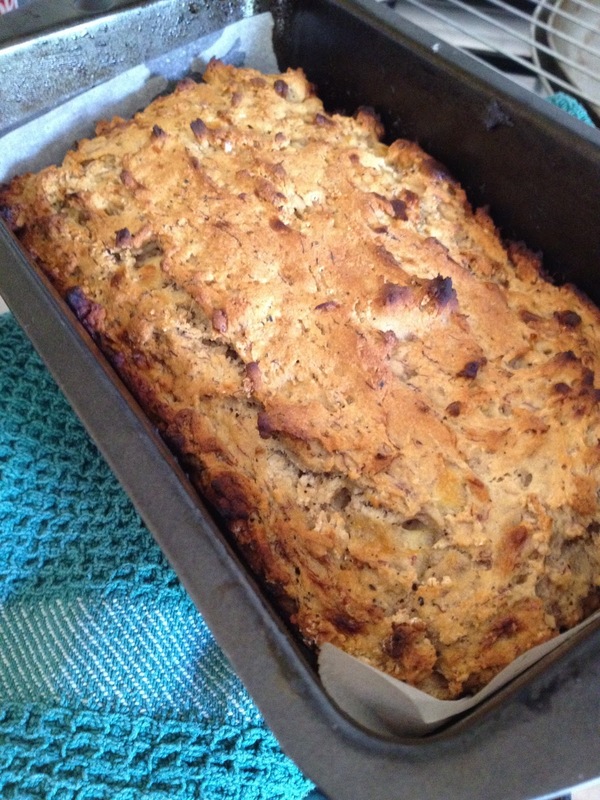 This rustic banana bread has a firm yet tender crumb - it's gluten-free AND vegan. Woo! Preheat oven to 180 C and grease and line a medium-sized loaf pan. Whisk oil, vanilla, salt, lemon juice and agave syrup, then add mashed banana and mix well. Sift together flour, wattle seed, anthem gum, baking powder and bicarb soda. Gently fold in banana mixture until well combined then pour batter into loaf pan, smoothing the top. Bake for 20-25 minutes until golden brown, or toothpick comes out clean. Let cool in tin for 10 mins then transfer to wire rack. 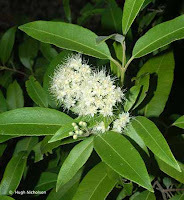 Backhousia citriodora, otherwise known as lemon myrtle, was named after James Backhouse, an English botany collector. It's a flowering rainforest tree, usually growing to around 8m tall, with the leaves prized for their lemony essential oils. It is the highest natural source of citral, beating even lemongrass. The leaves can be used fresh or dried, and in both savoury and sweet dishes - fish, chicken, vegetables as well as tea, biscuits or cakes. Now, I take kitchen failures very personally, so I'm persisting with gluten-free + vegan here. This is because just last week I was forced to admit defeat with a gluten-free cake that looked like a wet sponge sitting in a puddle of oil. And my most recent cookie attempt at Christmas time was a gingerbread so terrifyingly brittle I had to check my tooth repeatedly for cracks. 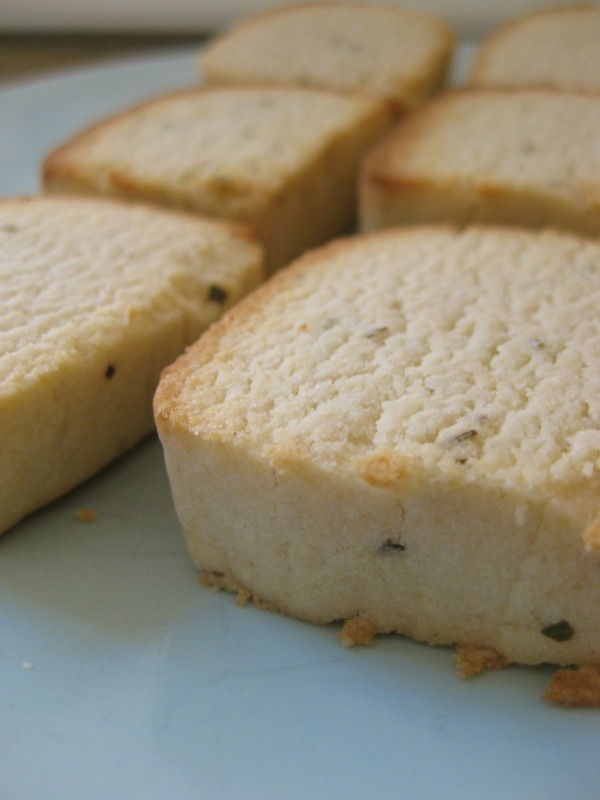 Thankfully, these shortbread cookies have a buttery, soft bite. That makes me happy. Preheat oven to 170 C and line a baking tray with baking paper. In a bowl, sift together flours, gum and sugar. Add vanilla extract then add pieces of cold margarine and rub into flours. Combine and bring together into a dough ball. Roll dough into a log, wrap tightly in cling wrap and put into freezer for 1/2 hour to firm up. Unwrap and slice into 1.5 cm discs, place on tray and bake for about 10mins. They should be just golden. Let cool on wire rack. Need a laxative? 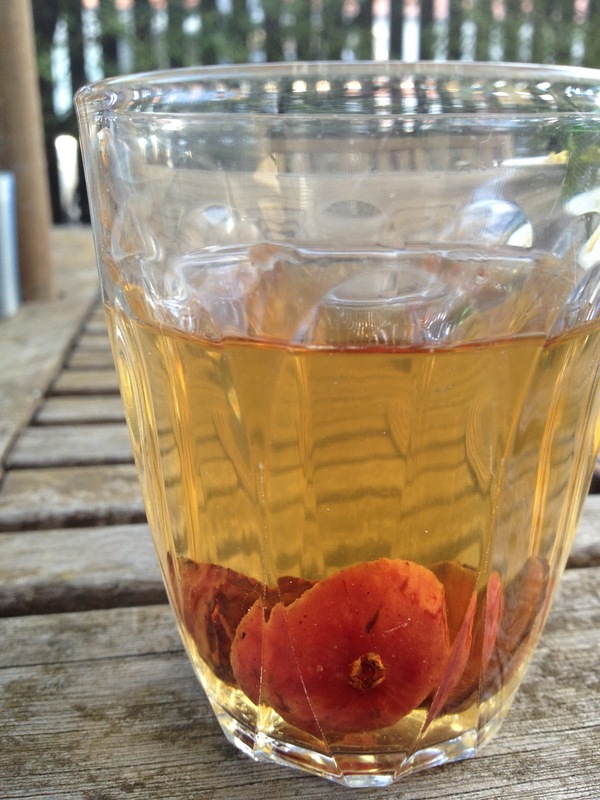 Try a quandong. The berries of this native Australian fruit tree (also referred to as wild or desert peach) were much valued by indigenous Australians for their medicinal purposes and often drunk as a tea for a bowel-cleansing effect. 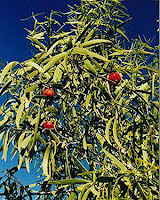 Quandong fruit can be eaten raw or dried, but mostly it is available in jars of dried quandong halves. You can rehydrate them in boiling water, and then cook until soft to make jam, or use in pies, cakes and tarts. Purchase online at Outback Chef - I've also seen them in Oxfam shops. To make a mildly sweet and earthy quandong tea, steep 3 quandong halves in boiling water per cup. 1. Fossilised Quandongs have been discovered in the coal seams of Southern Victoria. Apparently these fossils date from 40 million years ago - a time when Australia was still linked to the Antarctic continent. 2. Quandongs have a vitamin C content higher than oranges and and almost certainly saved many early Australian explorers from scurvy. 3. Quandong fruit can be dried and frozen for 8 years or more, without losing any flavour whatsoever. 4. 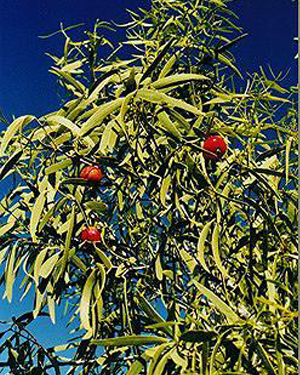 Quandong trees possess an aromatic wood that was traditionally used by aboriginal people in "smoking ceremonies". 5. Rural Australian children often used Quandong seeds as Chinese Checker pieces.